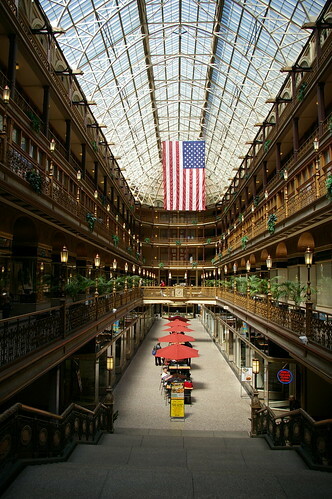 Cleveland Area History: Historic Cleveland: Where Would You Take a Visitor? Historic Cleveland: Where Would You Take a Visitor? It's finally getting to be that time of year when we want to go outside and see things. Some of us may even have guests from out of town. To that end, I ask the following question: Which historic sites would you take a visitor to see? This is a little bit different from asking which sites we think are most important. It's about which places we think have something that an outsider would care to see. Perhaps it's the Garfield Monument and the view from Lake View Cemetery. Or maybe you'd take them to see the USS Cod and the William G. Mather. 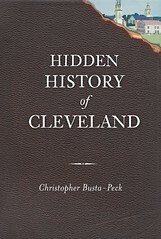 Or maybe you'd take them to see the site where the Cuyahoga River last burned. If I'm to judge from the quantity of photographs on Flickr, the most popular historic site with visitors is the West Side Market. This isn't about what's most important - it's about the history you love in your community. What parts of our history would you share with a visitor? The less well-known ones will be especially interesting, I think. I'll be compiling a map of the most popular/interesting sites. It'll be fun to see what it includes. They're visiting this July and we'll probably head to the Westside Market again. And we'll be doing a Cedar Point trip since it'll be summer. I hope you do a follow up post of where everyone else takes their visitors. I will be doing a follow up post. Not sure exactly how soon, as I hope to include a map as well, but it will happen. The Sachsenheim Hall on Dennison is a microcosm of eveyrthing great about Cleveland that exists to this day. The edifice isn't stunning but the interior and atmosphere is. Start in Tremont, then Ohio City (yes, check out West Side Market). Cross over Lorain Carnegie bridge to witness the Guardians of Transportation. Drive around downtown and show off Euclid Ave. cruise up Euclid and stop off at League Park. It's the only former major league ballpark still standing (what's actually left). Babe Ruth hit his 500th homer there and Joe Dimaggio made the last hit of his 56 game hitting streak there before being stopped the next day at the old stadium. Make sure to check out the Baker Electric showroom on Euclid and end up at University Circle, being sure to show them the old Model T factory that the Institute of Art occupies. Go into the Art Museum if they are so inclined. Drive around Murray Hill, Cleveland Hts. and Shaker Hts. Do some of that on a bicycle if possible. While you're visiting that West Side market, drive a quarter mile east on Lorain and explore W. 20th Street -- the block north of Lorain and the two blocks south to Abbey. Here you'll find a variety of 19th Century residential architecture. Turn right/ west on Abbey and go one or so blocks to Columbus; turn right/ north and drive the industrial flats around to Canal Road behind Tower City and look up at the Guardian pylons. Take the towpath south through the national park to Greenwood Village in Sagamore Hills (requires taking the connector trail at Mile 19). This is one of the most important Native American earthen enclosures in Ohio. The walls are still visible albeit two feet high. On the trip there one will view any number of historic buildings and elements of canal history as well as 1000 year old contiuously planted floodplain farms. The area's parks are a key historic asset. The national park has Greenwood Village; Rocky River Metropark has a like rare Middle Woodland earthwork at Little Cedar Point. Again only two feet of the walls remain but it's a great climb and scenic view. The same is true for Indian Point Park in Lake Metroparks in Painesville/ Leroy except that there is an upper parking lot there and the earthworks are both earlier and later built. While you're in Lake County take Route 174 from Willoughby to South Chagrin Metropark and see the beech maple forest, Chagrin River valley, Gates Mills and old homes. I just returned from a trip to Cleveland. Here's what I visited. The Wade Chapel at Lakeview Cemetary is not to be missed, nor the Garfield Memorial. I went to Chagrin Falls, rode the Rapid, went to the top of the Terminal Tower and saw the elephants at the Cleveland Zoo. I loved all the nostalgic candy at Sweeties and had big fun at Big Fun in Coventry. Cleveland is the best!